Product prices and availability are accurate as of 2019-04-10 08:42:39 EDT and are subject to change. Any price and availability information displayed on http://www.amazon.com/ at the time of purchase will apply to the purchase of this product. 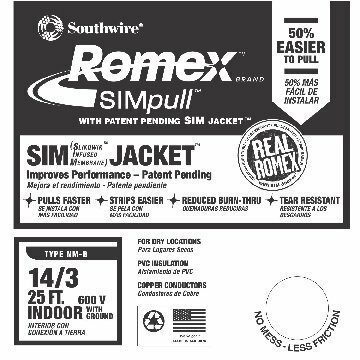 Southwire Non-metallic sheathed cable can be used for both exposed and concealed work in normally dry locations at temperatures not to exceed 90C (with ampacity limited to that for 60C conductors) as specified in the National Electrical Code1. 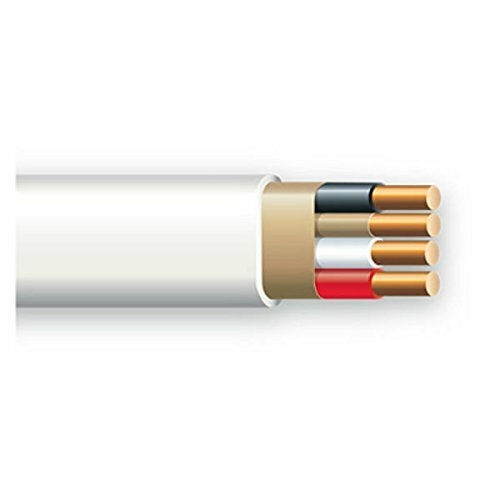 NM-B cable is primarily used in residential wiring as branch circuits for outlets, switches, and other loads. 50' 14/3 Non-metallic sheathed cable Primarily used in residential wiring as branch circuits for outlets, switches, and other loads Can be used for both exposed and concealed work in normally dry locations at temperatures not to exceed 90C Copper conductors Construction designed for easier pulling Pulls faster Strips easier Tear resistant.